home / Multimedia / The Holy Land in news / Gaza and Syria: The endless tragedies in the Middle East and the .. The Middle East is not familiar with truce. The humanitarian emergencies are still in full on more fronts than ever, the number of dead and injured keeps growing everyday and it is difficult to see a glimmer of anything other than violence. 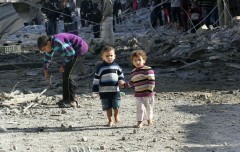 Also in nearby Syria the situation continues to be very serious: “Syria is a devastated country. There isn’t anything anymore, people have been pushed to the limits of their own strength” – tells us Fra Simon, supervisor of the San Paolo Region for the Custody of the Holy Land. According to the latest report by the Syrian Network for Human Rights one million one hundred thousand wounded have been documented since March 2011, date of the start of the conflict. 45% of them are children. 120,000 people have been forced to live with a permanent disability and with complications due to the amputation of limbs. The number of dead has reached 133,586, of which 15,149 are children. We remain as close as we can to the victims of these conflicts. Every contribution is essential to help those who suffer. The needs are huge and many people survive only thanks to the contributions that come from abroad, which get quickly transferred to the ground.